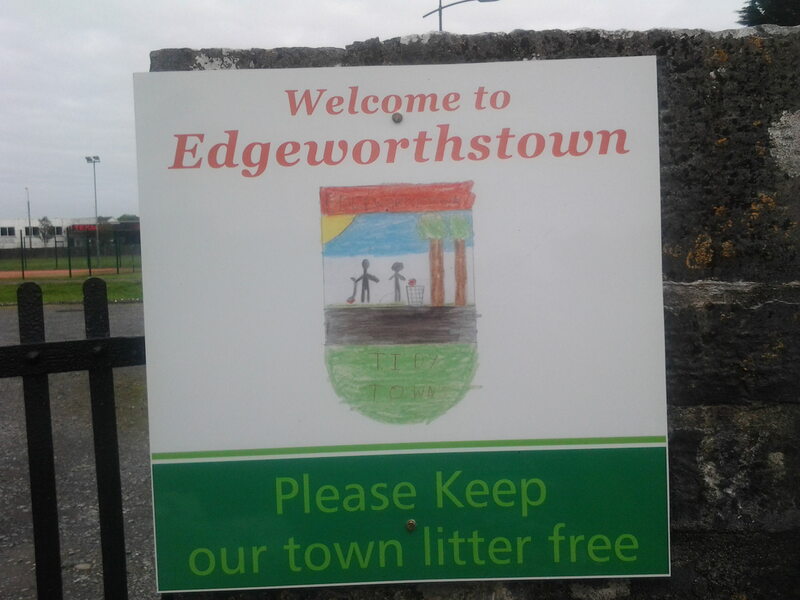 Edgeworthstown District Development Association Ltd.
Friday 10th May – 6.00 p.m.- Presentation of prizes to the winners of the Children’s Poetry Competition in The Green, Edgeworthstown. There will also be a Theatre Performance titled “The Lady of the Fertile Ridge” written by Pauline Flood, and performed by the Mostrim Youth Players. Free event. 4.00 p.m. – Unveiling of Murals, Granard Road, Edgeworthstown. 8.00 p.m. – An evening performance in the Manor Church, Edgeworthstown with Readings from Paul McVeigh and Nuala O’Connor, Story & Song with Aidan O’Hara, Music & Song with Eleanor Quaine and Comhaltas Ceoltoiri Eireann and presentation of prizes to Adult competition winners. Admission €5. Refreshments served. Also, Edgeworthstown 1619 to 2019 a Historical Review including readings from Goldsmith, Wilde and Edgeworth including music and song. Admission €5 – booking required. There was no jackpot winner. Numbers drawn: 7, 10, 13, 23. Longford Parkinson’s branch are holding their monthly meeting on Tuesday 9th of April in the Family Support Centre. April 8th to 14th is Parkinson’s awareness week with information points in Longford shopping centre on Friday 12th April from 10:30 until 2 pm and Davis Supervalu from 12 o clock until 4 pm. The Ms. Society (Longford Branch) wish to thank all who contributed towards their recent church gate collection. The amount collected was €488.75. Thanks to all the people who helped out with our collection. Alzheimer cafe Our next Alzheimer cafe will be held on Wednesday evening next, 24th April at 7.00pm. in the room at the back of Longford Credit Union. Entrance and car parking facility are at the rear of the building, between Longford Shopping Centre and Longford Motor taxation office. Guest Speaker on the night is Pat Chapman, Citizens Information, and his topic is The Fair Deal. This is an information and social evening with tea, coffee, and refreshments being served. Anyone who is affected by Dementia is welcome to come. For more information you can contact Eileen or Breda on 085 8724475 or Longford ASI office on 043 3348402 / 3347221. The Ballinalee Players present “Anyone Can Rob a Bank” by Thomas Coffey. An hilarious comedy and a weekend of great entertainment not to be missed. Friday 26th and Saturday 27th April @ 8pm, doors open 7.30pm. Sunday 28th April @7pm, doors open 6.30pm. Contact 086 1693563, email ballinaleeplayers@gmail.com or PM us on Facebook @ballinaleeplayers. Admission €10. Venue: Thomas Ashe Hall in Ballinalee. Donations in aid of The Parish Community Centre – the Old School. Granard Area Action Group presents the return of Alpha Cinema in Rath Mhuire Resource Centre, Granard on May 3rd at 9.00pm where they will host a Classic Movie Night. There will be a raffle and Spot Prizes on the night. An application for planning permission was submitted to Longford County Council in August ’15 for the new Community Library in Edgeworthstown. The building is to be developed by Longford County Council on a site owned by Edgeworthstown Development Association in a joint venture between the two organisations. Funding of €1.25 million from the Department of the Environment and the Libraries Capital Investment Programme was announced in January ’16. 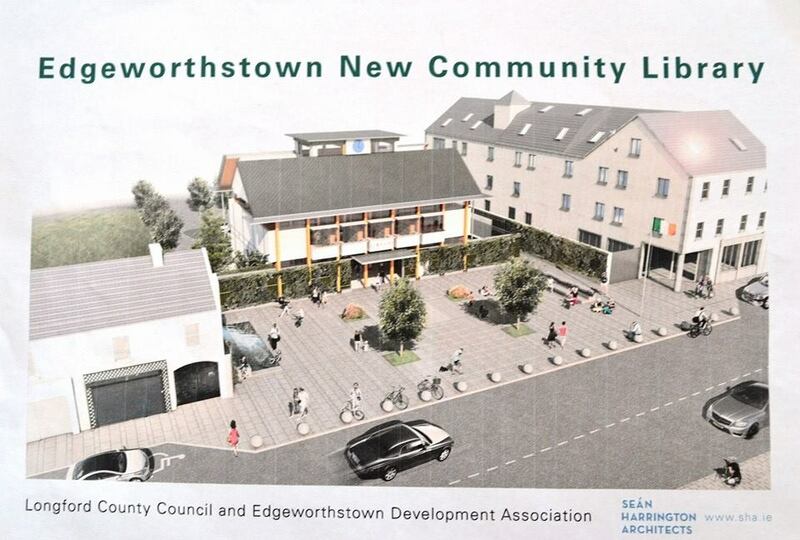 Edgeworthstown Development Association will also unveil plans for a new streetscape in the town shortly. It hopes that the library will be finished by 2017, the 250th anniversary of the birth of Maria Edgeworth and the 200th anniversary of the death of Richard Lovell Edgeworth. Meet at The Edgeworth Hotel Wednesdays (during the Summer months) at 7.30p.m. and Saturdays at 2.00 p.m.
Sunday morning litter picks continue each Sunday morning. I am Irish. How can I join? Our main work group meets outside the Edgeworth Hotel each Saturday afternoon at 2.00 p.m.
Is Éireannach mé. Conas is féidir liom a bheith páirteach? Buaileann ár bpríomhghrúpa oibre lasmuigh d’Óstán Edgeworth gach tráthnóna Dé Sathairn ag 2.00 p.m. I am Polish. How can I join? Jestem Polakiem. Jak mogę dołączyć? Nasza główna grupa robocza spotyka się poza hotelem Edgeworth w sobotnie popołudnie o godz. 2.00. I am Slovakian. How can I join? Som slovenčina. Ako sa môžem pripojiť? Naša hlavná pracovná skupina sa stretáva mimo hotela Edgeworth každú sobotu popoludní o 14.00 hod. I am Czech. How can I join? Jsem Čech. Jak se mohu připojit? Naše hlavní pracovní skupina se schází mimo Edgeworth Hotel každou sobotu odpoledne ve 14:00. I am Latvian. How can I join? Esmu latviešu valoda. Kā es varu pievienoties? Mūsu galvenā darba grupa tiekas ārpus viesnīcas Edgeworth Hotel katru sestdienu pēcpusdienā plkst. 14:00. I am Lithuanian. How can I join? Aš esu lietuvis. Kaip galiu prisijungti? Mūsų pagrindinė darbo grupė susitinka ne Edgeworth Hotel kiekvieną šeštadienio popietę, 14.00 val. I am Russian. How can I join? Я русский. Как я могу присоединиться? Наша основная рабочая группа встречается за пределами отеля Edgeworth каждую субботу днем в 14:00. I am Portugeuse. How can I join? Eu sou portugues. Como posso participar? Nosso principal grupo de trabalho se encontra fora do Edgeworth Hotel todas as tardes de sábado às 14h00. 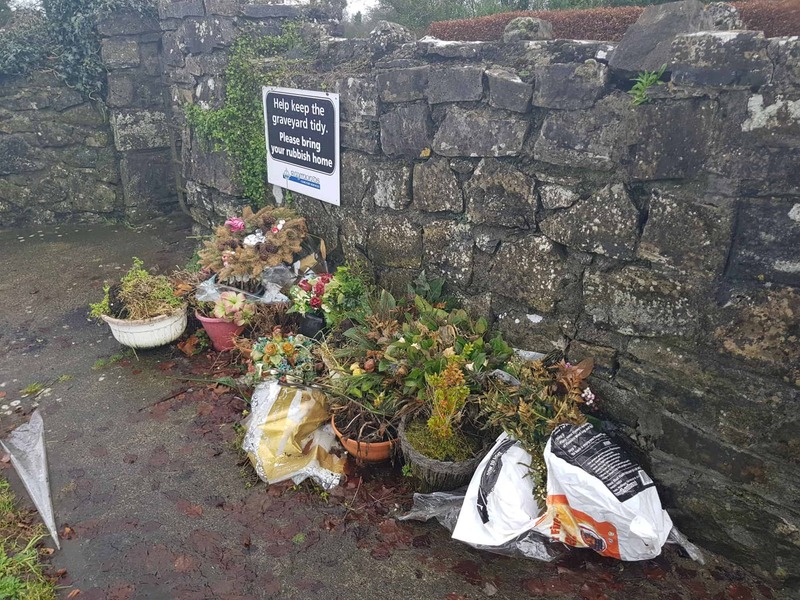 We are appealing to users of Aughafin Cemetery, when tending to the graves of loved ones, to bring their old flowers/plants/plant pots and general rubbish home. 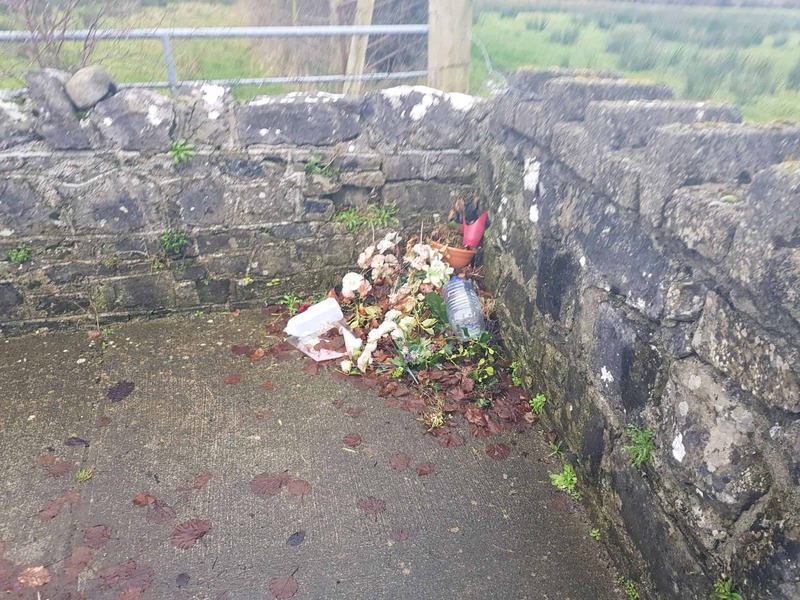 Longford County Council do not currently collect rubbish from the cemetery. Any discarded rubbish piles up and quickly becomes unsightly. Bring a plastic bag for soil and old plants/flowers which you can compost at home and collect plant pots and give them to the gardeners at Our Lady’s Manor. Be sure to check the Tidy Towns website and Facebook page as well as The Edgeworth Society website for more details and calendar of events locally. Use the links below. After almost 6 decades (25 years have been sponsored by SuperValu), TidyTowns continues to go from strength to strength. The competition was designed to bring communities togrther in a spirit of neighbourly pride for the town in which they live. It celebrates the power of individuals within communities to effect positive and sustainable transformation; the power of a village or town to become a stronger community. The results of the 2017 SuperValu TidyTowns Competition were announced on 24th September. Overall marks were 270, up from 263 in 2016, 253 in 2015 and 244 in 2014. Many thanks to all who worked throughout the year to achieve this very positive result. This is the result of Michael McCormack’s work and is an example of how one person’s efforts can make a difference. 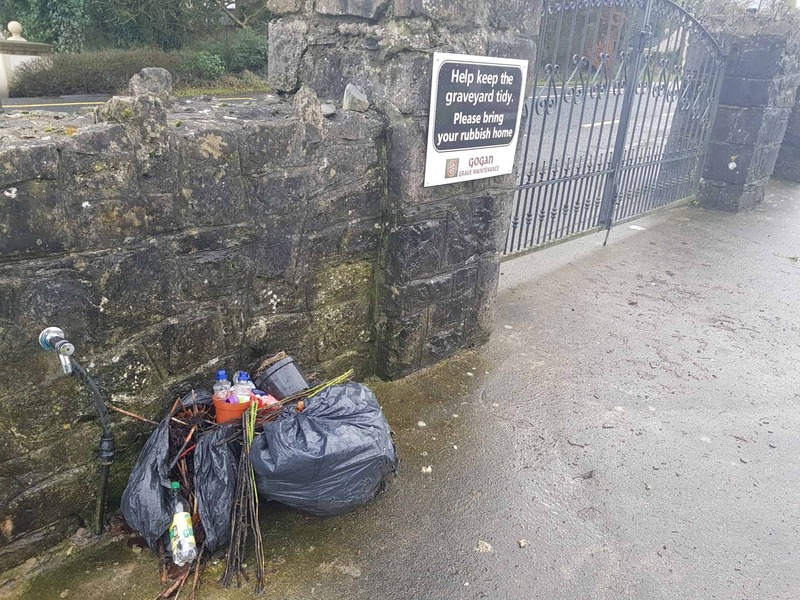 If you have pride in the town you live in and would like us to achieve higher marks please contribute a small amount of your time to work with the Tidy Towns group for a few hours each week. 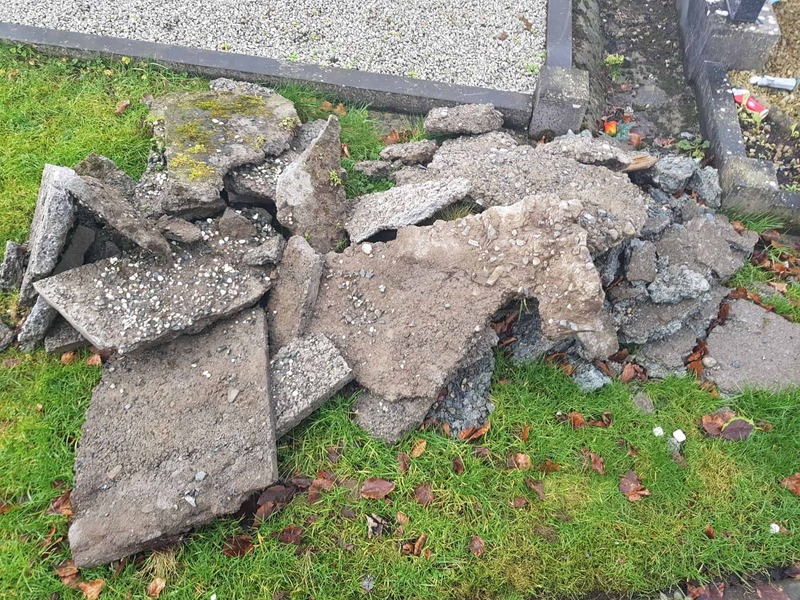 – contact Tom Dooley on 087-2405387. Volunteers needed for Saturday afternoon and Sunday morning litter picking (and for Wednesday evening work groups during the Summer). Or organise a group to litter pick in your own street, road or housing estate? Back in 2015 Gerry Lynn, Jimmy Connell and John McGerr discussed the idea of interviewing some members of the older generation of our parish with the idea of collecting their stories and memories. 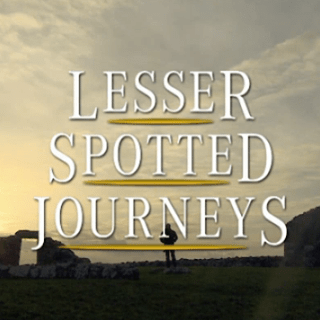 The resulting videos below are interivews of local people reflecting on times past and how life has changed in and around Edgeworthstown. The interviews were conducted by Jimmy Connell and filmed by John McGerr (many thanks guys). More interviews will be added here as they are made available. 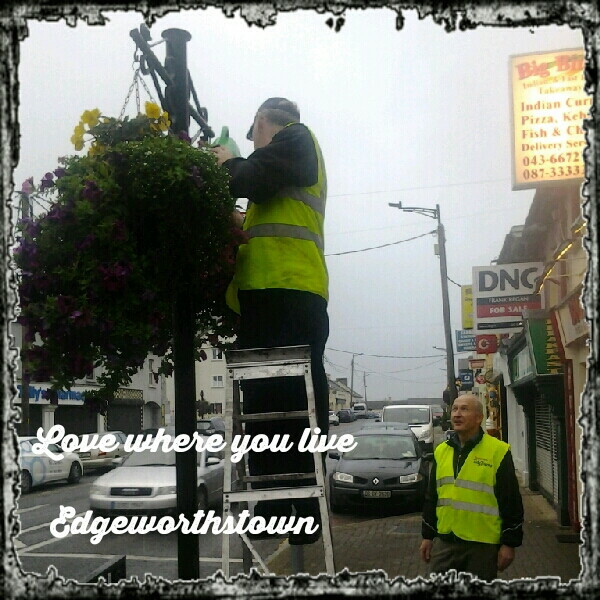 Ireland’s Heritage Hero, Matt, established Edgeworthstown District Development Association and the Edgeworth Society in 1994. Recently he has been the driving force behind the Edgeworth Heritage project which involved the establishment of the Edgeworth Heritage and Literary trail which takes in Edgeworthstown House and Walled Garden, St John’s Rectory with its Wilde and Goldsmith connections and St John’s Graveyard and Church. Other projects include the development of The Fair Green and The Old Schoolhouse which function todays for training and education purposes and continues the example set by Richard Lovell Egeworth and Maria Edgeworth. Well done Matt in achieving this national recognition of your efforts over many years. Check our website for full details and to download our new app for Android and iPhone – keep updated on the go. 9.45-10.45a.m. Beginners Total Body Fitness NEW CLASS !!! 8.00–9.00p.m. Basketball Senior Ladies team training. 9.00–10.00p.m. Basketball Senior Men’s team training. Tuesday: 11 a.m. – 5 p.m.
Library membership is free of charge with internet and printing/photocopying/scanning facilities. Books may be borrowed for up to 3 weeks and may be renewed online or by phone. On the days that the library is not open books can be returned by dropping them through the letter box (green door) of library. Coffee and information mornings for local residents take place every Monday at 11.00a.m. in the Community House, 43 Cloverwell, Edgeworthstown.